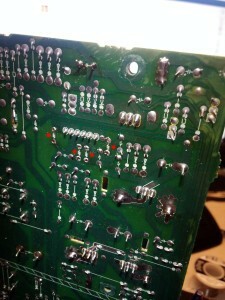 Without removing the board, you should be able to use a multimeter to measure the resistance of these resistors. According to the Internet, anything above 10 Ohms is considered bad. In my case, two resistors were completely open – infinity Ohms. 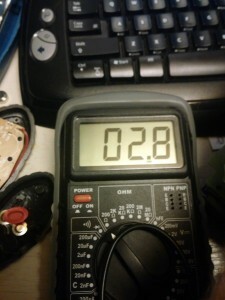 Two others tested at around 2.8 Ohms. 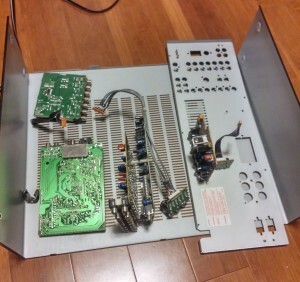 To achieve a good quality repair, the board needs to be removed. My approach was to remove the back panel and take out only the affected board. 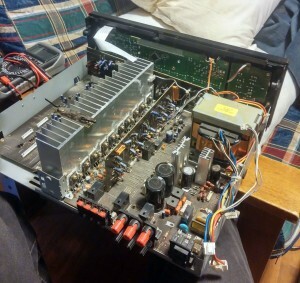 In hindsight, I really should have simply removed both boards together, with the rear panel attached, from the chassis. 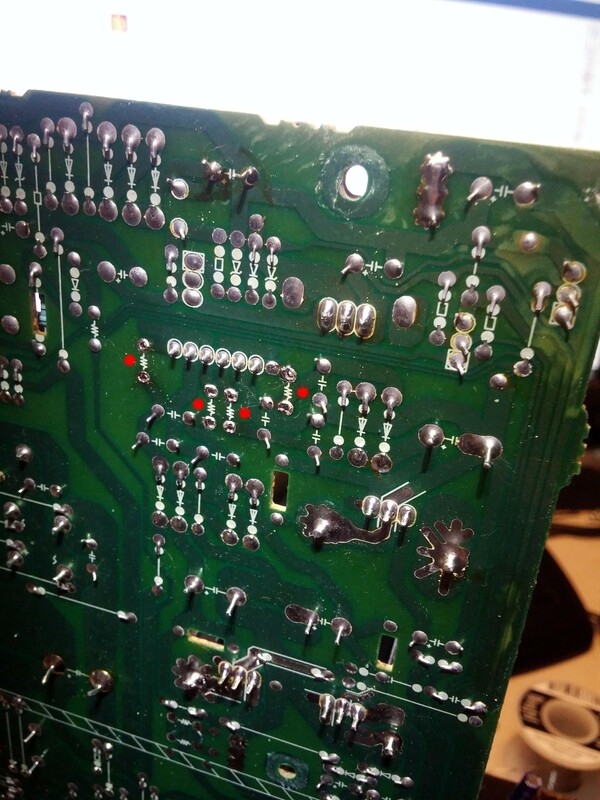 Once this board is removed, simply desolder the failed resistors and replace them with 1 Ohm, 1/2 Watt Metal-Film Flameproof resistors. From DigiKey these are $0.22 CAD each. At that price, I replaced all four at the same time. There is the possibility that the failure of these resistors coincides with the failure of the next components in the circuit: the 7815 and 7915 regulators. To test these, with the multimeter in the diode test mode, check that none of the regulator pins are shorted together, as is the most common failure mode. This was not the case for me, though I ordered one of each regulator just in case. The 7815 and 7915 regulators share the larger heatsink, while the 7805 is attached to the smaller single heatsink. If you’re lucky, these won’t need replacing, and simply changing the faulty resistors will bring your Denon receiver back to life! I also have a 1801 with which im very happy. But its also getting a bit of aging. I am planning to replace those resistors out of precaution. However im also thinking about recapping it. Do you know which values it needs? As you already had it open. Worth recapping with some nichicon kg’s? I have a avr-=2105 and those resistors are .22 ohm for me. I looked up on line could not find schematic for 1801, but did for 1802 and 1803 I believe, those are also .22ohm. are you substituting a 1 ohm for those? Does it shut down immediately when you turn the volume up, or only after a few minutes (like watching a movie)? 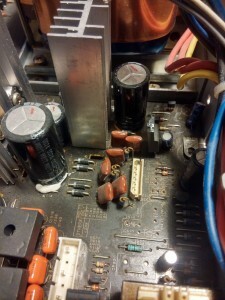 If it happens immediately, there could a problem with the power supply section, causing the overload protection to trip. If it happens after some times, I would suspect overheating. Make sure there is no dust inside, and that there is enough air circulating. I read the thread above suggesting replacing the R141 etc 0.22Ohm 1W resistor (as per factory) with 1 Ohm 0.5W one – is it necessary to change the specs of these to make the unit work? Or is it just out of convenience (availability)? I selected the 1 Ohm, 1/2W resistors as per the thread I linked here. It appears the different AVR models have different resistors. The resistors in my amplifier appeared to be 1/4W units, certainly nowhere near large enough to be 1W. 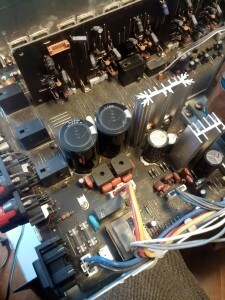 I will say, after 2.5 years, my amplifier fires up every single day without fail using the above resistors. Thanks so much for documenting this. 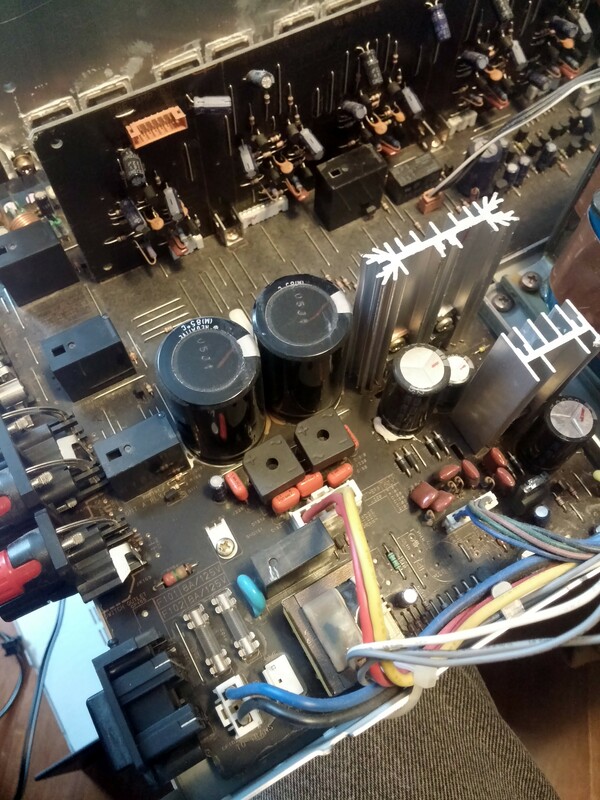 I experienced this issue after owning the amp for more than 15 years and was not happy with the thought of going out and buying a new one. After a couple of bucks and a couple of hours…good as new.